Community and health worker engagement will be key to polio eradication in Karachi, Pakistan. 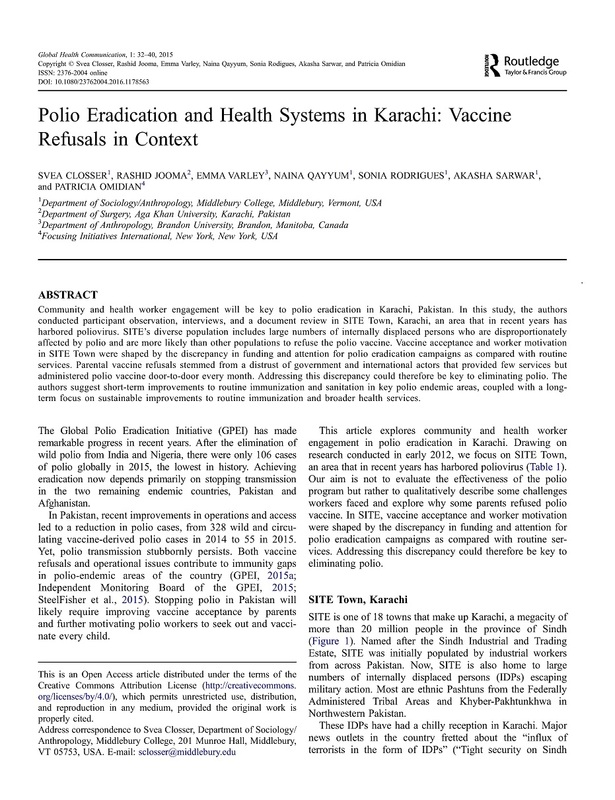 In this study, the authors conducted participant observation, interviews, and a document review in SITE Town, Karachi, an area that in recent years has harbored poliovirus. SITE’s diverse population includes large numbers of internally displaced persons who are disproportionately affected by polio and are more likely than other populations to refuse the polio vaccine. Vaccine acceptance and worker motivation in SITE Town were shaped by the discrepancy in funding and attention for polio eradication campaigns as compared with routine services. Parental vaccine refusals stemmed from a distrust of government and international actors that provided few services but administered polio vaccine door-to-door every month. Addressing this discrepancy could therefore be key to eliminating polio. The authors suggest short-term improvements to routine immunization and sanitation in key polio endemic areas, coupled with a long-term focus on sustainable improvements to routine immunization and broader health services. To read the full, open access article in the journal Global Health Communication, click here.